Purpose: Several studies concluded that oncologic results of laparoscopic colon cancer resection are not inferior to those of open resection. 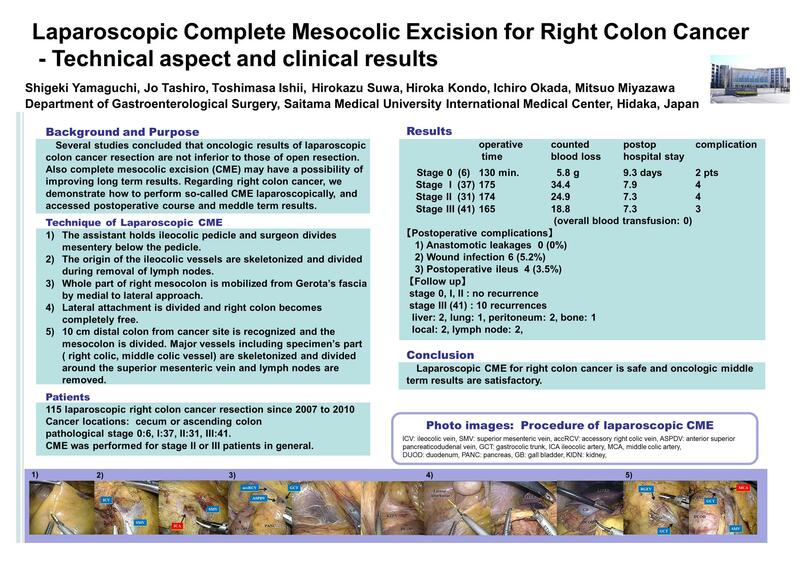 Also complete mesocolic excision (CME) may have a possibility of improving long term results. Regarding right colon cancer, we demonstrate how to perform so-called CME laparoscopically, and accessed postoperative course and meddle term results. Methods: [Laparoscopic CME] First of all, assistant holds ileocolic pedicle and surgeon divides mesentery below the pedicle. The origin of the ileocolic vessels are skeletonized and lymph nodes are removed. Then whole part of right mesocolon is mobilized from Gerota’s fascia by medial to lateral approach. Lateral attachment is divided and right colon becomes completely free. Finally 10 cm distal colon from cancer site is recognized and divides the mesocolon. Major vessels including specimen’s part ( right colic, middle colic vessel) are skeletonized around the superior mesenteric vein and lymph nodes are removed. [Clinical data] One hundred fifteen patients underwent laparoscopic right colon cancer resection since 2007 to 2010. Cancer locations were the cecum or the ascending colon and pathological stage was; 0:6, I:37, II:31, III:41. Generally CME was performed for stage II or III patients. Results: Mean operative time (OT) was 130 minutes for stage 0, 175 min. for Stage I, 174 min. for stage II and 165 min. for stage III. Mean counted blood loss (CBL) was; 5.8, 34.4, 24.9, 18.8g, mean postoperative hospital stay was; 9.3, 7.9, 7.3, 7.3 days, respectively. Postoperative complications occurred in 2, 4, 4, 3 patients. There was no leak and 6 wound infection and 4 ileus. So far there is no recurrence in stage 0, I, II patients. In 41 stage III patients, 10 recurrences were observed. Those were liver: 2, lung: 1, peritoneum: 2, local: 2, lymph node: 2, and bone: 1. Conclusions: Laparoscopic CME for right colon cancer is safe and oncologic middle term results are satisfactory.